I bought this polish AGES ago, probably the beginning of last year, and yesterday I was going through my boxes to find polishes that I hadn't swatched and I found this one. I can't believe I forgot about it and it got lost amongst my stash. I didn't even include it in my gold foil comparison. I'll have to do another one now. The above photo was taken in the sun, below indoors under artificial light. 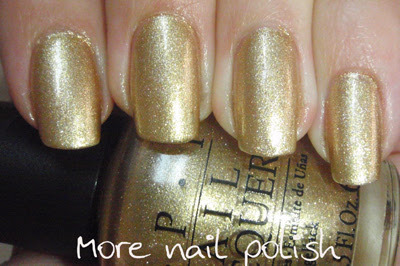 OPI - I get a kick out of gold is an older polish, but you can still get it on ebay. 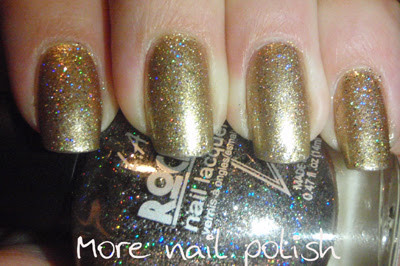 But, given that there are so many gold foil polishes out there that would be almost dupes of this, it's not one that you need to go out and get. 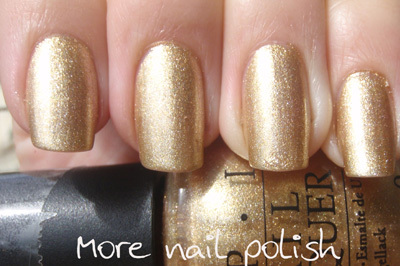 What I like about this gold is that it is a cool tone (like Orly Lux and Jessica Palladium). This was three coats + one Seche Vite. To mix it up a bit, last night I added two coats of LA Girls Rock Star Double Platinum. I love this polish but have never been able to get it opaque enough to do a swatch of it on its own. 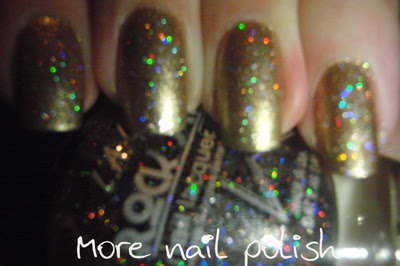 LA Girls Rock Star Double Platinum is a holographic glitter in a slightly smokey, almost clear base. Here is the full sun pic from this morning. Under artificial light last night. And the obligatory blurry shot to show the glitter. It makes me smile looking at my nails today, what a shame I have to take it off to put on the green magnetic polish that turned up in the post today! !